Washington Duke returned to his small farm in what was then Orange County as a penniless Confederate veteran in the early summer of 1865. Aided by his three children still at home-Mary E., Benjamin N., and James B. Duke-the hard-working farmer soon hit on the idea of the home manufacture of smoking tobacco, which he peddled from a wagon in the populous eastern portion of the state. In 1874 Washington Duke decided to abandon farming altogether and to follow his oldest son, Brodie L. Duke, to the fast-growing new town of Durham. There the Dukes joined a number of other small tobacco manufacturers who hoped to grow rich in the business. An important development came in 1878 when, for $14,000, young George W. Watts of Baltimore purchased a one-fifth interest in the newly formed W. Duke, Sons and Company. All of the small tobacco businesses were overshadowed by the W. T. Blackwell Company with its famous Bull Durham brand of smoking tobacco. Despairing of ever catching up to, much less overtaking, the Blackwell company, the youngest of the Dukes, James, persuaded his father and other partners to gamble on machine-made cigarettes, even though the established cigarette producers in Richmond, Va., and elsewhere believed that smokers much preferred the custom-made, hand-rolled product. The Duke firm, nevertheless, negotiated a secret contract with the company that controlled the cigarette-producing machine invented by and named after Virginian James A. Bonsack. Beginning in 1885, the Duke firm's gamble on the machine paid off handsomely, and within five years W. Duke, Sons and Company, had become the largest cigarette manufacturer in the nation. Partly through limiting access to the Bonsack machine, James B. Duke joined with four other leading cigarette manufacturers to form the American Tobacco Company in 1890, and the 33-year-old became president of the "trust." After that date, W. Duke, Sons and Company, gradually lost its separate identity. 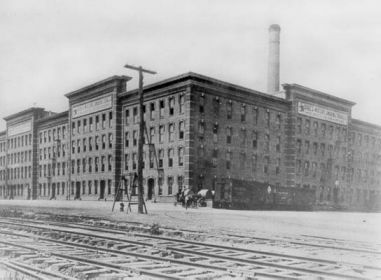 In the twentieth century a large Liggett and Myers plant would stand approximately where the first Duke factory in Durham had been, and some of the old brick warehouses would find new lives as condominiums and a fashionable shopping mall. Robert F. Durden, The Dukes of Durham, 1865-1929 (1975). "W. Duke, Sons & Co., branch of American Tobacco Co. ca. 1900." Image available from the Durham County Library. Available from http://durhamcountylibrary.org/exhibits/dhpa/photo_archives/c/c025.php (accessed June 14, 2012). 1 January 2006 | Durden, Robert F.